Monsoon season has arrived in India. Monsoon is a term first used in English in Briton Indian (now India, Bangladesh, and Pakistan) and neighbouring countries to refer to the big seasonal winds blowing from the Bay of Bengal and Arabian Sea in the southwest bringing heavy rainfall to the area. Extremely wet or dry events within the monsoon period have increased since 1980. The last two years where dry events caused by El Nino. 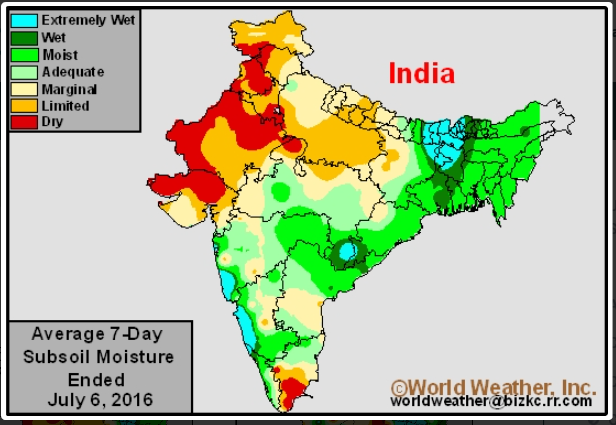 Take a look at the subsoil moisture map of India above, as of January, 2016. The map clearly shows the impact El Nino had on the monsoon. The lack of rain created a shortage of food as crops failed due to drought. The result was very high prices paid for Canadian pulses (lentils, peas, and chickpea). Fast forward a few months as we shift from the strongest El Nino phase in history to a La Nina phase and we get a wet monsoon. Generally, the monsoon starts in June and runs till September. The monsoon rain this year has been sporadic but there has been a general improvement in the subsoil condition as the monsoon advances from the southeast and tracks northwest. The subsoil’s have been depleted and aquifers are running low. It might take more that one good monsoon season to bring up the water levels to normal. The chart below for July 6th, 2016 shows the recovery in the subsoil moisture. 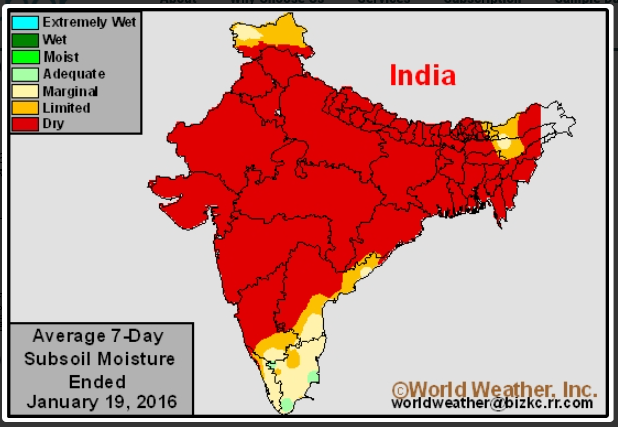 We will need to focus on the progression of the monsoon to see if the northwest part of India gets replenished with much needed moisture. 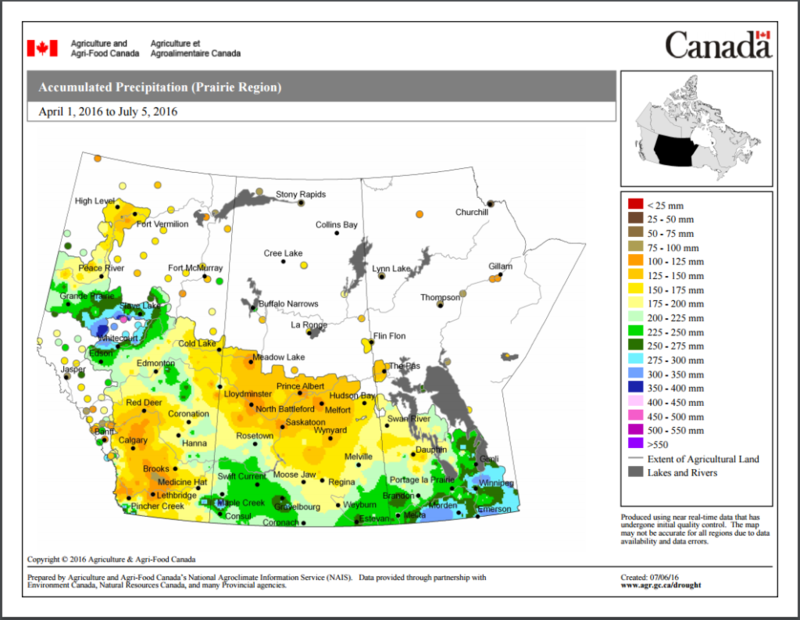 Canadian soil moisture conditions have been variable but generally the entire lentil growing region is adequate to extremely wet. Lentils DO NOT like wet conditions. In the industry we say that lentils do not like WET FEET. Disease and too much rain can impact the yield and quality of the crop. Lentils like drought stress to mature properly. For this reason, growers are hoping the weather will shift to warmer and dryer conditions. For now, we can safely say that the rain can stop anytime soon. If that happens there are 5.8 million acres of lentils planted with the potential to produce a record 4.0 million metric tonnes with 3.0 million of those tonnes being red lentils.